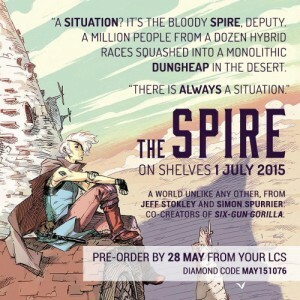 The Spire rises out of the minds co-creators, writer Si Spurrier and cartoonist Jeff Stokely — whose Six-Gun Gorilla brought acclaim and (it’s assumed) the finest meats and cheese from throughout the land — and hails from BOOM! Studios this July. This eight issue series focuses on Shå, the commander of the City Watch. Shå is charged with keeping the peace while she herself sidesteps prejudice, injustice and hatred for being more human than human while also more non-human than non-human. Shå is an outsider’s outsider. The Spire pivots around Shå’s investigation of a grisly murder that has taken place in the Spire’s lower levels, among the dregs, while higher up the socio-political ladder, a new power, the Baroness Tavi, ascends the throne.